I’m going to start this post by saying that I’m pretty damn extra and most of my at home beauty regime will come with me when I go away. 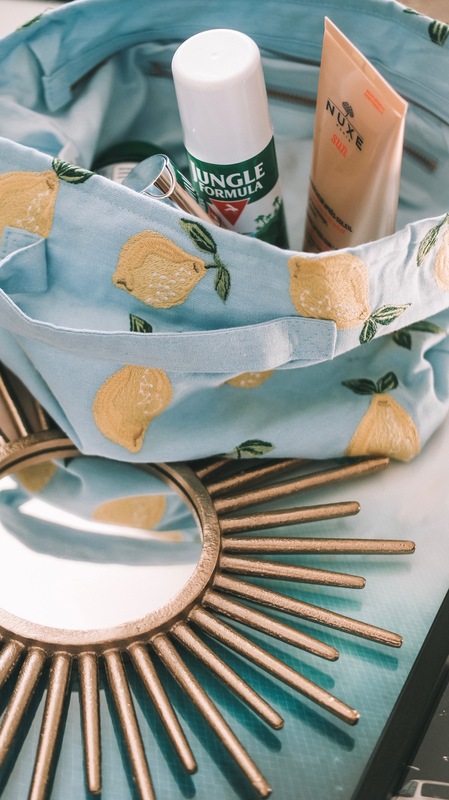 All of my beauty bits are beautifully packaged in my new Elizabeth Scarlett Lemon wash bag. Anyone who saw my house tour will remember seeing her bits dotted around, let’s just say I’m a fan ok? So let’s do this in phases because there is SO much that I have to talk to you about here I really don’t know where to even begin! So my fave skincare is pretty similar to at home. There’s a few things I’ve been using regularly that have massively helped with my complexion and are lightening my spot scars slowly but surely. Combined it’s my new Jade Stone and the Pai rosehip oil. This combo is GREAT. I’ve also added the skinceuticals SPF cream to my everyday routine as apparently you need to!? Anyway this is clearly something that has to be packed for holidays and I think having a good quality face sun cream will stop you from getting greasy skin and spots. For the holiday I added in the Clinique moisture surge concentration face cream which I’ve actually continued using since I got home. 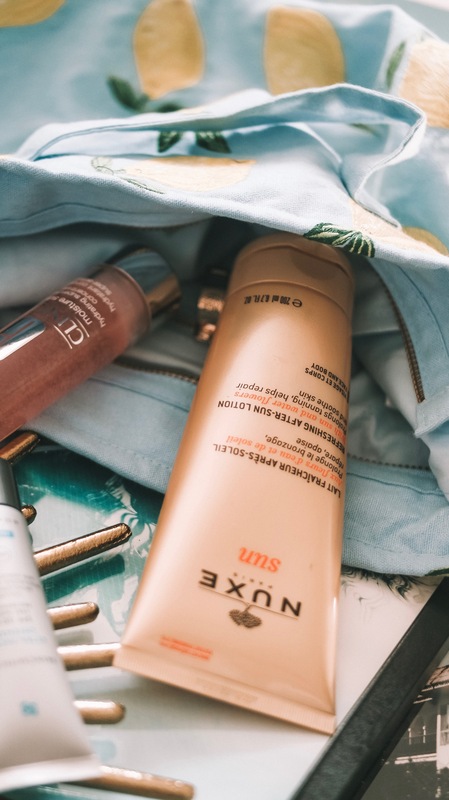 I used it a lot on the flight, see my inflight beauty routine here, and my skin dries out terribly on holiday so it’s been a life saver! I got these new sun teams from Shiseido just before I went away. Usually I use the Clinique Suncreams and I 100% rate them but I thought I’d give these newbies a go! I didn’t really get a chance to give them a proper go as it was overcast and humid for most of our stay in Thailand but the smell and texture is great and it’s super easy to apply. I’ll let you know after my next trip if they stop me from burning! I’ve relied on the Nuxe aftersun for a while and if I’m not using this on holiday I’ll be using the Nuxe huile Prodigieuse body and hair oil. It’s the perfect multifunctional product and when you’ve got limited packing space it’s a life saver! I was sent these minis from Percy and Reed a while back so this was the perfect opportunity to give them a go. They made my hair so lovely and soft after being in the Chlorine pool and the smell is divine. I know I keep talking about the smell of things guys but to me it’s really important! I also found a new best friend in the wonder balm. I put it on when I’ve just towel dried my hair then again when my hairs dry as a sort of serum/smoothed/styler. It works guys. Finally, something I never knew existed but always needed was the aveda hair veil. You put it on your partin and it stops your scalp from burning but it isn’t greasy and doesn’t ruin your hair. UH MAZING. ok so when you’re going to somewhere like Thailand it would be down right irresponsible to not think about taking lotions and potions with you. I’ve found over my time travelling that the best insect repellent is the jungle fever. It’s strong enough to stop you from getting bitten but not so potent that it melts your leather handbag strap to your skin. Not funny guys, this actually happened to me once! If you do actually get bitten then don’t bother with the actual bite stuff, use white tigerbalm. It is literally a god send! Another medicine I literally relied on when travelling and won’t go anywhere without these days is charcoal capsules. Forget Imodium, this is what you need when you get a bad stomach. Instead of blocking you up, it soaks up all of the bad stuff and returns you back to normal in literally no time at all! Finally, something else I have to take with me travelling is rescue remedy. I’m a little more than a worry wart and my anxiety medication just doesn’t cut it when I’m travelling. I need double dosage! I find the pastilles so so soothing and the drops if I don’t want to take the pastilles out with me. When I’m away it’s pretty much guaranteed that I will wake up with some form of anxiety every day when I’m away, no idea what it is but i get it every time! This just helps me to sort it out and calm myself down! I’d love to hear if you guys have any travel beauty essentials that you think I should try! I’m off again in August to Portugal so any tips I would highly appreciate!!! !